Go to the current results near the bottom of this page. 12 markers for $101 (including $2 handling; $4 outside USA). 37 markers for $121 (including $2 for handling; $4 outside USA). 67 markers for $250 (including $2 for handling; $4 outside USA). 12 are usually enough to separate different branches of a Roper family. The higher markers help to distinguish different branches of a family. Click here to contribute to paying for more Roper tests. This web pages changes regularly. If you have not viewed it for a while, be sure to reload it to override its old version in your computer's cache. This Roper Y-chromosome project was among the first surnames to establish projects with Family Tree DNA. I have initiated a project for testing the genetic connections of males with the surname Roper by analyzing the DNA in Y chromosomes. I would also like to test Roper female lines by analyzing mitochrondia DNA. Elementary genetics teaches that a human egg becomes a female embryo when a sperm gives it an X chromosome (mostly DNA) and a male embryo when the sperm gives it a Y chromosome (mostly DNA). Thus the Y chromosome is passed down generations only through the male line. You might want to read some articles about the Y chromosome. The only change from one generation to the next is by mutations, which are rare. So one can determine male paternal lineage by comparing the DNA coding of Y-chromosomes. There are "junk" regions on the Y-chromosome that contain repeated base-pair sets (microsatellites or Short Tandem Repeats or STR). Over time the number of repeats changes due to mutations. The number of repeats at these locations, called markers can be used to distinguish different male-line families. Thus, the detailed structure in terms of base-pair coding is not required; only information about certain aspects of a small part of the Y-chromosome is needed. This does not identify the individual, but only the family to which the individual belongs; determining the 12 or 25 markers (see below) is much less information than that obtained by totally sequencing the Y-chromosome. There are several labs that do such work, at a cost of about $100 per person. So one can determine male paternal lineage by comparing the DNA coding of Y chromosomes. This was recently done for descendants of a slave woman, Sally Hemings, of Thomas Jefferson, with the result that one of her sons had a Jefferson Y chromosome, either from Thomas or one of his near relatives. See Alan Savin's short article Introduction to Genetic Genealogy. Mr. Savin has also written an excellent booklet entitled DNA For Family Historians. You can purchase it from him: USA: US $ 5.99 (plus US $1.00 for airmail posting), UK: £3.99 (includes 2nd class post). Other countries: e-mail (alan@savin.org) for the actual price, but it will be similar to the USA price in local currency. Personal cheques in any currency should be made payable to "Alan Savin" and sent to: Genetic Genealogy Guides, 9 Bannard Road, Maidenhead, Berkshire, England SL6 4NG. Remember to enclose a note with your address. A very complete web site on DNA & the Family Historian is available. I have initiated a Y-chromosome DNA testing project for the male Roper line. Each male Roper participant commits himself to provide a mouth-swab sample to be analyzed by a competent DNA laboratory, with the understanding that it may be found that he is not actually in a male Roper line. (Several with the surname Roper come from a woman ancestor with surname Roper.) The participant must also provide me with his Roper family tree as far back into the past as possible. We will need to have a sizeable group from several currently unconnected Roper lines to make this project feasible. If you are a male with surname Roper and wish to participate in this project, send me e-mail: roperld@vt.edu. I will need as complete a set of family data as possible, to correlate the test results with genealogical data. I have arranged for a company http://www.familytreedna.com/ to do the Y-chromosomes tests for the Roper family. If you wish to participate in the Roper genetics project, send me e-mail: roperld@vt.edu or go to http://www.familytreedna.com/surname_det.asp?count=35&group=Roper, and you will be sent the details to be followed and one of the test kits. The 12-marker test costs $99, the 25-marker test costs $169 and the 37-marker test cost $229. (There is a shipping fee of $2 for the USA and $4 outside the USA.) Usually the 12-marker test will indicate in which major family a Roper male resides. (I know of a Buchanan and a Roper with 12 marker matches, but the pair has 7 relative mutations for the last 13 markers.) 12 markers work well when starting testing males of a given surname; but 25 markers are needed after a surname project is well underway to determine the branches of the family by one or two relative mutations. For a study about the efficacy of only doing 12 marker tests, see http://newsarch.rootsweb.com/th/read/GENEALOGY-DNA/2002-08/1030558442. There are many Roper male lines in the United States and England that cannot be connected by data from documents. The twice burning of the court house records in New Kent County, Virginia destroyed all of the Roper records up to 1864, so many Southern Roper lines that emanated from that county cannot be connected. We probably will never know exactly how the early Ropers in Virginia fit together, because the St. Peter's parish records and other meager data are not sufficient. Probably the best we can do is find out which families from there are related by Y-chromosome testing of at least one male-line Roper in each family that connects back to early Virginia. This project should allow some judgments to be made about how closely related these several Roper male lines are. Many of the testees are in the R1b1 haplogroup, the largest European haplogroup. One should be cautious about putting individuals with only 12 markers measured in a family; it is possible that more markers could be greatly different. Another view of the Roper markers. 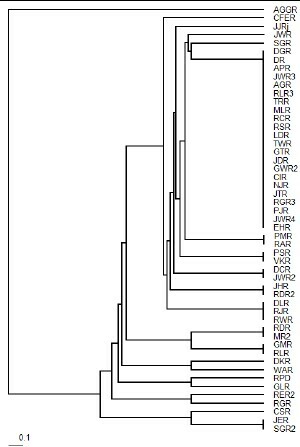 See below for a chart of the relative mutations for the different branches of RY1. RoperY2 RY2 LWR(RY2a), GWR(RY2b) An English Roper in Australia & a Diss, Norfolk, England Roper. They differ by 4 relative mutations; 3 of the 4 are for highly variable locations. RoperY4 RY4 DTCR(RY4a), GAR(RY4b), WGRD(RY4c) Perhaps RY4 and RY8 are the same family. RoperY5 RY5 HSR, AWR, ITR, CR2, DJR, EJR2, JHR2, JAR, SJAR HSR & AWR are WV USA, the rest are English (Norfolk/Suffolk). There are no surnames which have 1 or 2 relative mutations for 25 markers with this Roper family, so I conclude that this occurence of the Roper surname is relatively old. Perhaps RY4 and RY8 are the same family. RoperY11 RY11 SR, TMR Uncertain since only 12 markers have been measured for TMR. RaperY1 RaY1 DMRa, TARa & DWRa There are no surnames which have 1 or 2 relative mutations for 25 markers with this Raper family, so I conclude that this occurence of the Raper surname is relatively old. Only families with 25 or more markers are classified. As a check, I had my Y-chromosome analyzed by a different laboratory (http://www.oxfordancestors.com) that uses a slightly different set of 10 markers. For the 9 markers that overlap between the two tests there is total agreement between the two laboratories. I joined the National Geographic Society Genographic Project. The 12 markers determined by that project agree with those determined by Family Tree DNA. We do not know the name or location of this English Roper ancestor, but he was probably in Norfolk, Suffolk or Kent County. As of 20 April 2005 two English Roper (PJR & AGGR), with Suffolk County, England Roper ancestry, matches these 12 markers; so we should probably call this family the Suffolk/Norfolk,England-USA-Roper (EMUR) family. One that is very different than the others (WSR) is known from documents to descend from a female Roper (Isolda Roper and Richard Fourneaux). Another (DTCR) is a central English family. A third is from an eastern English family. 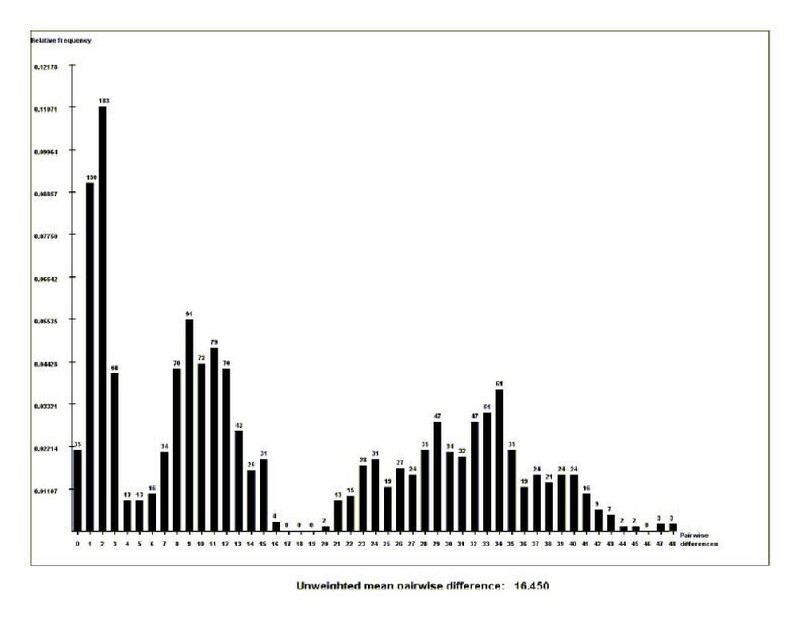 There is one, CMR, that differs considerably from the identical ones, but differs by only two markers from LWR. It appears that CMR is from a Western England family (see below). HSR and AWR define a completely different Virginia/West Virginia Roper family than most Ropers who originate in the USA from Virginia. ITR in England is also a member of that family. The ones that differ so much from the Majority USA Roper family, excluding WSR, possibly define different Roper families other than the Majority USA Roper family. Random mutations (probability of about 0.2% per generation for each Y-chromosome location) caused the differences. 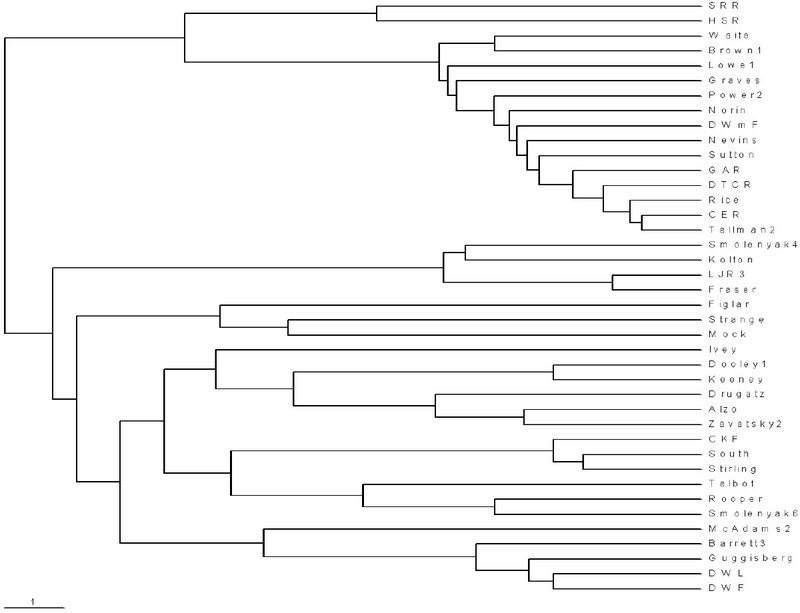 This indicates that many participants have a reasonably recent common ancestor according to the probability graph and table given below (taken from http://www.familytreedna.com/techfaq.html). 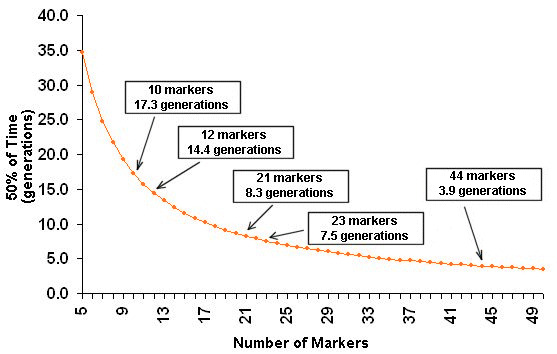 The chart shows that the most probable number of generations for a common ancestor is about 15 for those that differ by one digit in one marker, but could be much lower or higher. I have a case in my mother's Franklin family where two males that are known to be related through four generations differ by one digit in one marker. This illustrates that such a single mutation can occur within a small number of generations. It is interesting that the northern Ropers (CFER & NJR), whose ancestors are known to come from County Norfolk in eastern England, and the southern Ropers are related. It appears that there are different Roper families in the east (Norfolk/Kent) and west (Dorset) and central (Stafford, Worcester, Warwick) parts of England that are not closely related, and that the Eastern one is most closely related to the southern USA Ropers, which agrees with much documentary evidence. However, HSR descends from Nicholas Roper, whose gravestone indicates that he came from County Suffolk, England, which is in eastern England, and his 12 markers are very different from the Majority USA Roper family's 12 markers. We can take this as the defining marker set for the common Roper ancestor in eastern England of the northern-USA and southern-USA Ropers in the USA. 6 participants have one step mutations from the above set in 6 different locations. This illustrates the random nature of mutations. The Roper ancestors of the 15 participants who have the same 11 or 12 markers descend from what I call "a Roper family in eastern England", whose progenitor is purported to have come from Brittany with William the Conqueror in 1066 to county Derby, then to Kent, then to Suffolk, then to Norfolk, then to Durham and elswhere in England and the USA. (We know that the Massachusetts Ropers came from county Norfolk and that two of the 12 matching participants belongs to that family.) Cavalli-Sforza shows that the Bretons are closely related to the Irish and Welsh Celts and the Basques farther south in the Pyrenees. "The Breton language is a Celtic language closely related to Welsh, Cornish, Manx, and Irish and Scottish Gaelic. It is the everyday language of an estimated 250,000 people in Brittany, the far western peninsula of France." a sentence from http://www.breizh.net/ICDBL/saozg/index.htm. An interesting web site about the Bretagne Celtic people is: http://www.bretagne-celtic.com/an/accueil_an.htm. The members of HG1 are thought to be the descendants of the Paleolithic hunter-gatherers who arrived in Europe before the last Ice Age about 40,000 years ago (Aurignacian culture). That pattern is most common in Western Europe, but is also found in all other parts of Europe. The members of HG2 are believed to be the descendants of two later waves of humans into Europe. The last of these waves arrived about 8,000 years ago and is credited with introducing agriculture into Europe. HG2 is most common in Southern and Central Europe, but that haplogroup is also often seen in those of Anglo-Saxon and Scandinavian descent. The haplogroup HG3 is seen more frequently on the eastern side of Europe (9% of the population of Turkey is HG3). But HG3 is also common in Scandinavia, and is said by some to be indicative of "Viking blood" when seen in paternal lines originating in the British Isles. The forefather of all HG3's is thought to have been born in the Ukraine during the last Ice Age about 15,000 years ago. Keep in mind that haplogroup classification is fairly useless for locating the place of origin of your paternal line. While each haplogroup has general areas in which it is more common, there has been enough mixing of people on the European continent to prevent using these classifications to pinpoint any single place of origin. We do not know the name or location of this English Roper ancestor, but he was probably in Lincoln, Norfolk, Suffolk or Kent County England. different Y-chromosome locations about once every 7000 years. There are 153 known haplogroups. Haplotypes defined by the 25 STR markers are subgroups under the haplogroups. So, what else was happening in eastern Britain at the onset of the Mesolithic (20,000 -> 12,150 years ago) ... There was one descendant of Rox (R1b1c) surviving there from before the Younger Dryas (13,000 -> 11,500 years ago) but re-expanding immediately after the YD. This was R1b-6 (R1b1c3), the core type of which is unique to Britain. It is found in only 1% of the British sample population. ... Two-thirds of R1b-6 representatives are found in eastern England, the Channel Islands and Dorchester, while 82% are restricted to eastern England: Norfolk, Southwell, Bourne and York. ... The distribution of the founder type suggest R1b-6 may have mutated from Rox somewhere in the English Channel (when it was mostly dry), and from there moved up into Norfolk and north-east england. ... Norfolk and East Anglia were still linked to the Continent at this stage. 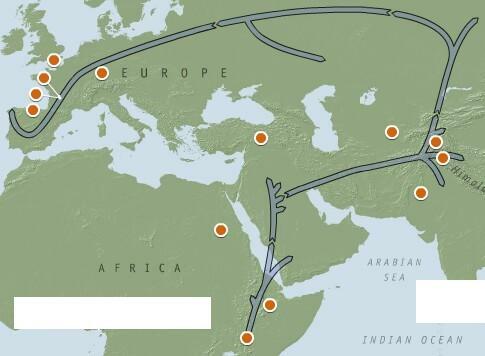 So the MUR family took the long scenic ancient paleolithic route from Africa to Europe, rather than than the short more recent neolithic route. From Family Tree DNA: Haplogroup R1b is the most common haplogroup in European populations. It is believed to have expanded throughout Europe as humans re-colonized after the last glacial maximum 10-12 thousand years ago. This lineage is also the haplogroup containing the Atlantic modal haplotype. 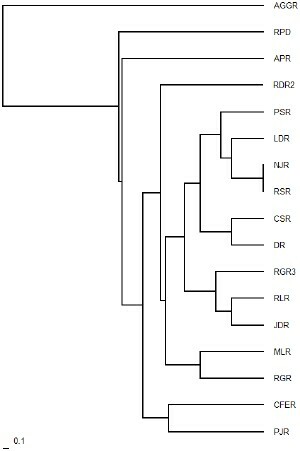 Note that RPD, DLR, PSR, RLR, WAR, CFER, DKR & JWR differ by one digit in two markers from each other, but are still closely related, which we know from the relations they have with the two identical Ropers. JJR, LWR, CMR and GKR appear to be in separate Roper families of their own. The Roper families of DTCR or HSR or SSR are not at all closely related to the other families or to each other, except note that GAR & DTCR differ only by 4 relative mutations. HSR and IRT are in the same family. DMRa and TARa are in the same Raper family with 2 relative mutations, which definitions their two branches of their Raper family. 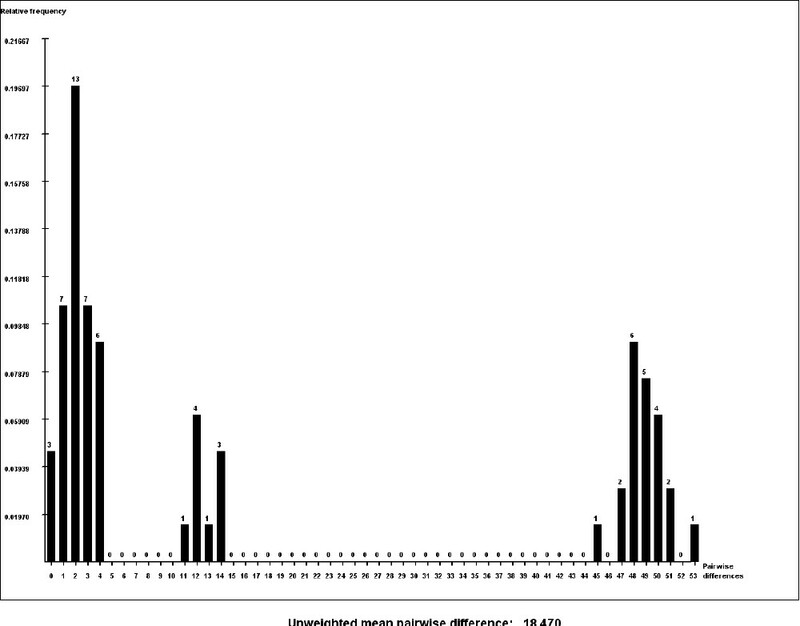 The 25 markers for EJR and WSR differ by 3 mutations. Two of the mutations are for a highly variable marker DYS385a. This is strong evidence they descend from the same ancestor about 20 generations ago or less. EJR descends from Ropers in Dorset and WSR descends from Ropers in Derby, so I do not see from the genealogy how the two families connect. WSR descends from a Roper woman, Isolda Roper b 1402 Turnditch, Derby and Richard Fourneax, Jr., who changed his surname to Roper under the conditions of the marriage settlement in 1428. There are 14 generations from Isolda to WSR. So it appears that EJR most probably descends from Isolda, also, since there are no Roper males back in time from her in that line. According to Family Tree DNA, the most rapidly varying markers are DYS385a, DYS385b, DYS458, DYS459a, DYS459b, DYS449, DYS464a, DYS464b, DYS464c and DYS464d. 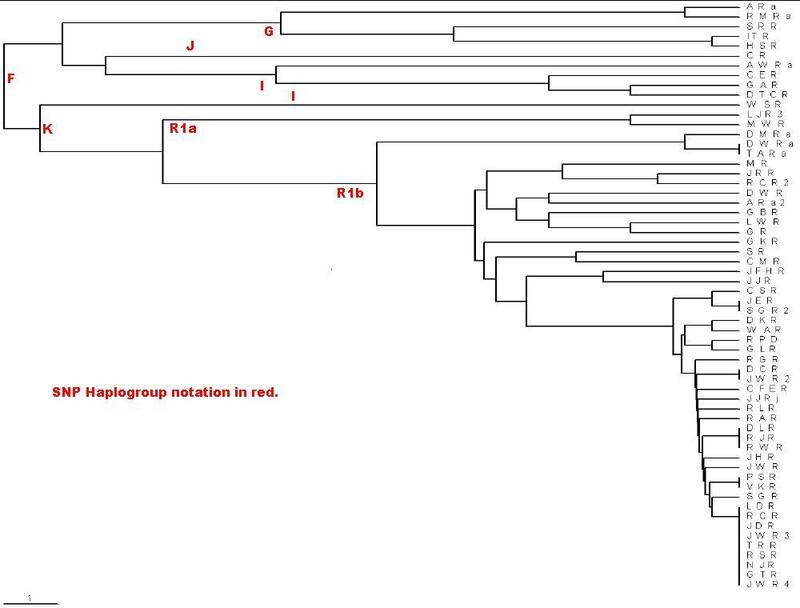 The markers in red have a faster mutation rate then the average, and therefore these markers are very helpful at splitting lineages into subsets, or branches, within a family tree. The agreement of the two relative mutations with MUR of JER and SGR2 is a good check of the accuracy of the markers measurements, since SGR2 is an uncle of JER. 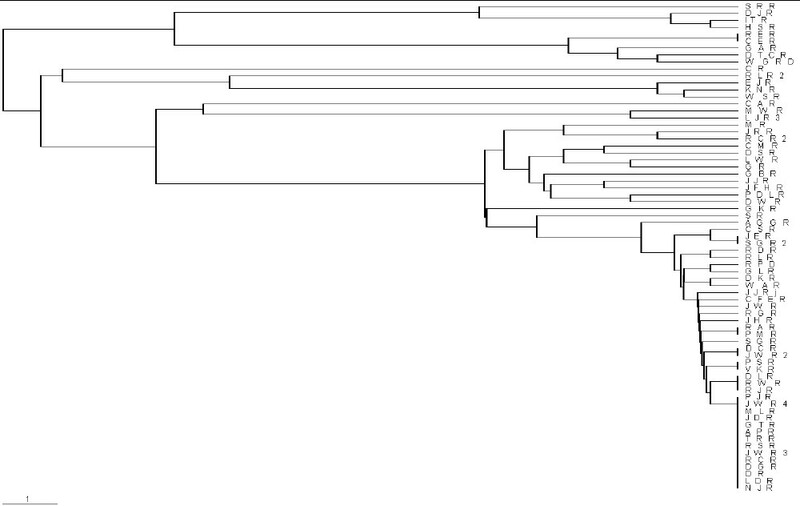 This is not a family tree in the usual sense. Only the ones with very short horizontal lines on the right are closely related. 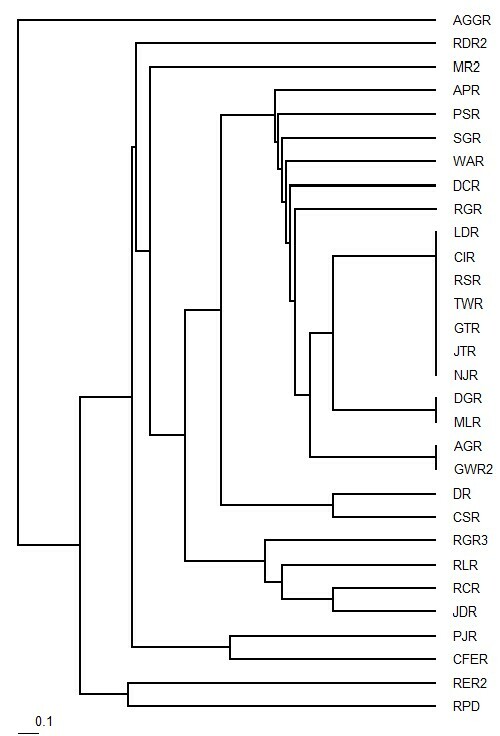 TRR is the same as GTR, LDR, JDR, JWR3, JWR4, RST and NJR: 8 now with the original MUR 25 markers. 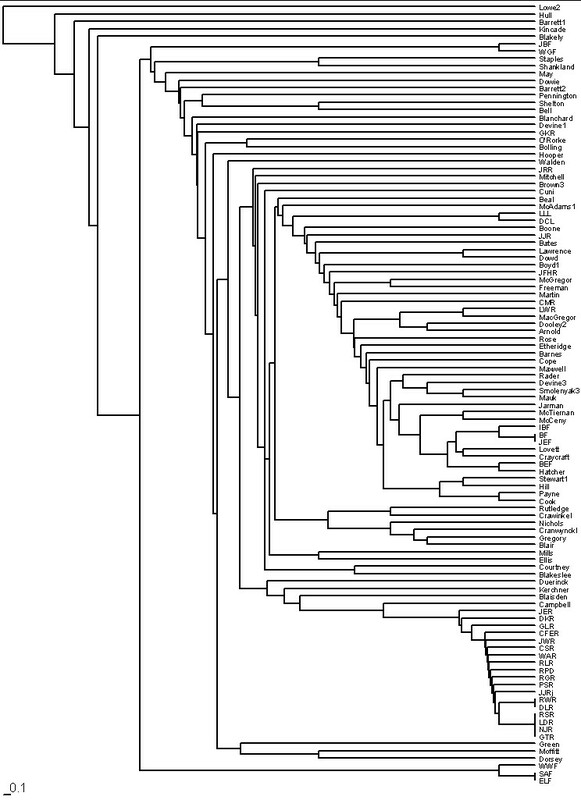 Note the scale in the lower left corner for 1 mutation back to the most recent common ancestor. Vertical distances indicate connections. We see, near the bottom, that the nearest families to the MUR/RoperY1 family are Campbell, Blaisden, Kerchner and Duerinck families. The following shows some of the older families for which I have collected 25 markers and the older families I have had measured in the Roper, Franklin and Little families. I used only the first 21 markers in these comparisons, because of some uncertainty about how to compare the four DYS464 markers. It appears plausible that SRR & HSR are part of an ancient Roper family. GAR & DTCR are perhaps in the same Roper family, perhaps along with CER, with perhaps a surname change of Rice & Tallman for two branches. The left peak is due to EMUR, the middle peak is solely due to SR, and the right peak is due to EJR & CAR. No. 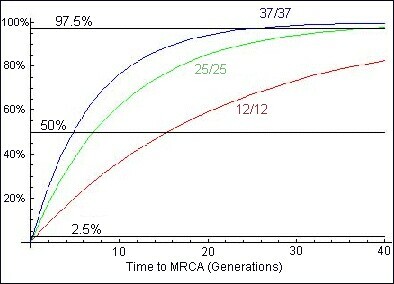 of markers tested MRCA for 50 % prob. MRCA for 90 % prob. MRCA for 1 marker diff. prob. peak MRCAs for 1 marker diff. prob. half max. See Y-Chromosome Markers Probabilities for a more detailed discussion. (prefix DYS): 393 390 385b 388 439 389a 392 389b 458 459b 447 449 464c 464d 456 576 CDYa CDYb 442 Kit No. In my wildest dreams I never expected to get such wonderful results from this project. Most southern Ropers tested have been shown to be related, the southern Ropers with Virginia origin have been shown to be related to the northern Ropers with Massachusetts origin and, before that, County Norfolk England origin, and the large Roper family in Nova Scotia with Virginia origin has been shown to belong to the same family. Thus the project has put together our large Majority USA Roper family. Some of us are planning a "reunion" of this extended family for October 2003. There are some more unconnected southern Roper families that need to be tested. The next step is to test some English Ropers who descend from Kent, Suffolk and Norfolk counties; one such sample with Kent origin has been tested (JFHR) and is not the same as the Majority USA Roper family. In the comparison of the 25 markers with many other families it is shown that the Majority USA Roper family is most closely related to the Jarmin family (4 relative mutations for 25 markers). LWR is most closely related to the Cope, Craycraft, Lawrence and Lovett families (4 relative mutations for each family for 25 markers). Watch this location (http://www.roperld.com/RoperGenetics.htm#results) in the future as more results come in.